College graduate. Licensed Cosmetologist. Licensed Stockbroker. And now…I can now add the title of “Certified TEFL (Teaching English as a Foreign Language) Teacher” to my strange string of skills and qualifications. I’ve realized by now that I am a complicated individual. I go into one profession and onto the next because I get bored easily. I like to be challenged. No, I NEED to be challenged. So when it came time for me to make a decision about how to get TEFL certified, it only felt right to choose the route that would challenge me the most. That meant that I would need to max out my credit cards to fly out to Chicago for 4 weeks to complete the TEFL course in person. The tuition? 3 times the amount what it would have been to just complete the course online. Not to mention, the money I had to dish out to find a place to stay for 4 weeks during the course. I had never been to Chicago and I knew no one in the city. It seemed irresponsible and stupid to choose to do the course in person, when I could just pay a fraction of the price to finish the course in the leisure of my own home on my own time. But if you know anything about me…I never take the conventional route. 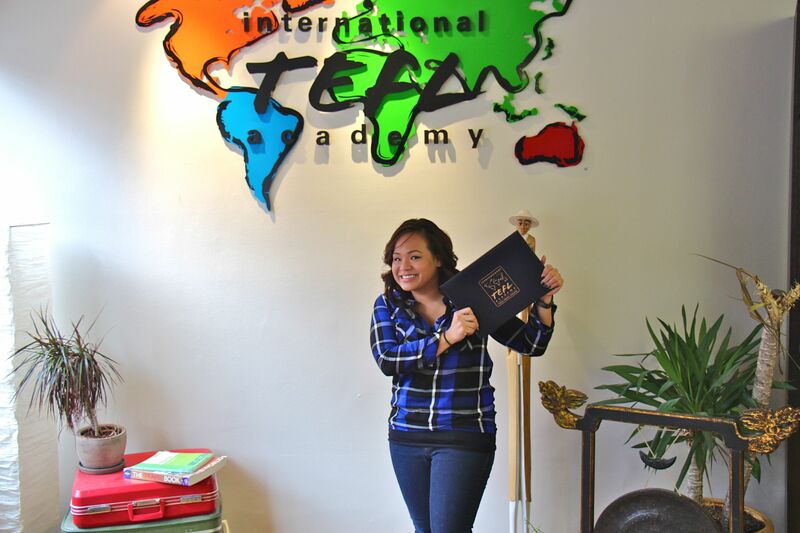 When I initially saw that the International TEFL Academy was located in Chicago, my heart fluttered. I knew I wanted to go to Chicago, but I had to work out all the details before I could go. I contemplated the idea for months. I researched all the TEFL websites and schools week after week. It took me 3 months to take the jump and finally book my plane ticket to Chicago. 4 weeks. 20 days of class. Monday through Friday. 9:30am-5:30pm on most days. 9:30am-8:00pm on teaching practicum days. It doesn’t sound so bad right? But trust me when I tell you, I have never been pushed harder in my life than in those 4 weeks. Okay okay…I’ll admit that a major reason why it was difficult for me was because I wanted to play just as hard as I worked. I wasn’t willing to surrender all my weekends and nights to lesson planning. I completely underestimated the amount of time, work, and effort that needed to be dedicated to this TEFL course. Sitting in a classroom for over 8 hours, trying to process English grammar concepts and internalize a myriad of teaching methods definitely will fry your brain. We had readings, critical writing assignments, class presentations, and lesson plans that were due practically every day. By the end of a class day, the last thing I wanted to do was come up with some creative insightful ideas to throw on paper and present to the class the next day. As much as I wanted to be on top of things, I found myself rushing to complete each assignment minutes before they were due. Putting together PowerPoint Presentations just minutes before I had to get up to present, typing up writing assignments like a mad woman, and brushing up on English grammar concepts that I hadn’t seen since I was in the 7th grade. Some nights, I didn’t sleep at all. Black coffee and Red Bull became my new best friends. It was all exhausting and exhilarating at the same time. We chopped up the English language every which way you could. Articles. Adjectives. Adverbs. Those damn gerunds and infinitives. I felt like I was being force-fed big spoonfuls of English, and I had to regurgitate it over and over again. Before I started the course, I thought I had a damn good grasp of English. But since taking the course, I realized that knowing the language is only half the battle. It’s not enough to know what is right or wrong, I must also be able to explain it thoroughly backwards and forwards. The best part about the ITA classroom experience was the interaction. Not just with the instructors, but also with the 9 other students who I grew to love. 10 people in one room for over 8 hours almost every day…it was definitely interesting to say the least. We had a widespread range of ages (from 21-29) in the group. Each person brought a different element to the class, which made for a unique experience. I was pleased to be in the presence of such dynamic individuals. I never thought that I could grow so fond of a group of people in such a short time. I even got choked up and had to fight back tears when it came time to say goodbye to everyone. I’ve always been the type of person that weighs all the cons and pros of any situation or decision. Sometimes it’s not so clear-cut and I never feel ready to take the leap. If there’s anything that I have learned, it’s that we’ll never be completely ready for anything. There’s always some missing piece to the puzzle. There’s always some reason not to. But often times, the only obstacle that we must overcome is ourselves. Everything else? It will fall into place somehow someway if you want it bad enough. Although it cost me an arm and 2 legs to go to Chicago for the ITA TEFL course, it was time and money well spent. Dare I say…one of the best decisions of my life? To the International TEFL Academy in Chicago, Teacher Betsy, Svetlana, and all my fellow TEFLERS…thank you for the memories and helping me lay all my doubts to rest as I go on my next endeavor. This entry was posted in TEACH, Teaching, Travels, WATCH and tagged Chicago, Decisions, English, TEACH, Teacher, Teaching, Teaching English, TEFL, TEFL course, TESOL. Bookmark the permalink.